This is an original Dwarven Coin from Peter Jackson’s 2014 fantasy adaptation, The Hobbin: The Desolation of Smaug & The Hobbit: The Battle of the Five Armies. The film continues the story of Bilbo Baggins (Martin Freeman) who joins a band of Dwarves on their quest to reclaim their homeland from the great dragon, Smaug. This coin was made for use on set of the city of Erebor within the Lonely Mountain where the Smaug rules over the treasure within the ancient city. 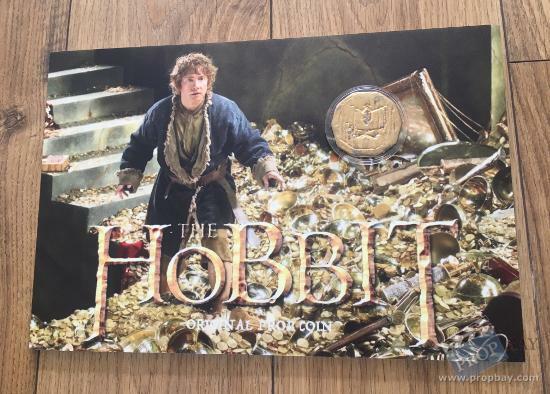 While not easily seen in close up within the mounds of treasure during The Desolation of Smaug, coins of this style can be easily identified during the Battle of the Five Armies. Cast from metal, this coin is shaped like a heptagon with seven sides. Added: 08-26-2017 - Viewed: 828 times.